Capture traffic from everyday searches. Rise to the top of Google online searches. Utilizing this tool that links to your website, you’ll be seen by customers at the very moment they search on Google. 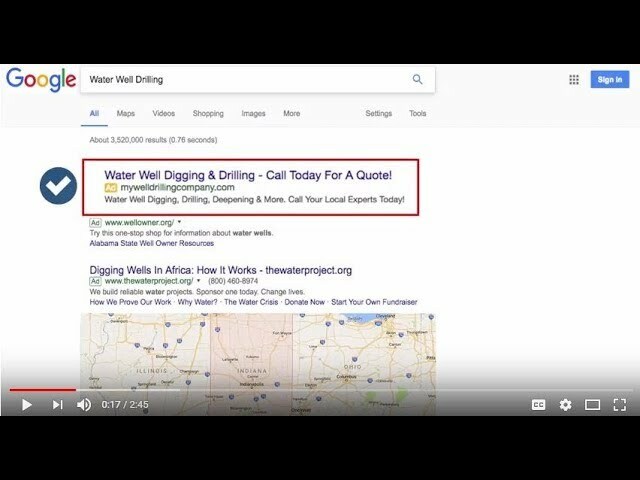 If you search “well drilling” on Google, what are the first results you see? It’s most likely ads – what Google calls AdWords or Pay-Per-Click (PPC) Ads. Franklin Electric has partnered with Ferguson Advertising, a third-party team of website developers and digital marketers, to offer Google AdWords Marketing services, applying standard online advertising methods to promote your business on relevant Google searches. Ferguson’s experts have developed ads to drive customers to your website when they are in your service area and searching for services like yours. You tell us how much you want to spend per month, and we’ll do all the legwork to run the ads. We’ll also provide a monthly report so you can monitor activity. Verify your Key Dealer profile. This ensures we have all the information we need to create effective ads for your business. Choose how much you’d like to spend per month and provide credit card information. A minimum of $100 per month is required, and a 25% management fee will be added, which will go directly to Ferguson Advertising. You can pause or cancel your service at any time through your Key Dealer dashboard. Submit! Your ads will start running the first day of the next month, provided we have your information within 5 business days of the end of the month. How much does it cost? $250 one-time setup fee, and you decide your monthly spend ($100 minimum). Ferguson Advertising will recommend a monthly budget for your region when you reach that question in the checkout process. All payments will go directly to Ferguson Advertising. How long does it take? If you’ve already verified your Key Dealer profile, it will only take a minute to purchase the Google AdWords Marketing service. If not, it may take up to 10 minutes to complete. After you submit, we will start running your ads the first day of the next month, provided we have your information within 5 business days of the end of the month. You will need to provide a credit card number. We will charge the card once for your one-time setup fee, then once per month for your monthly ad spend plus the management fee. You’ll be able to set your monthly spend on the payment screen during checkout. You can increase or decrease your monthly spend as you see fit through your Key Dealer dashboard. You can stop service at any time, for any reason, through your dashboard. A report will be sent to you monthly so you can monitor performance. Franklin Electric has partnered with Ferguson Advertising, a third-party team of website developers and digital marketers, to offer Google AdWords Marketing services, applying standard online advertising methods to promote your business on relevant Google searches based on the budget you set. If you want to be found online by homeowners seeking services you offer, don’t miss this opportunity – get started on AdWords marketing today!